Lack of positional play, lack of coaching or lack of personnel? Here are the things. We are having huge problems all over the lines and still relays too heavily on individual brilliance to take us through, it was the case against Roma and it was again the case against Wolfsburg when an angry Cristiano decided to take the game all by himself. The lack of clear cut chances weren’t just down to luck it showed inherent flaws in this teams all over the field. The main problem of this team I see is in positional Problems. The structure of the team is not right. Instead of making and forcing a right structure what Zidane did is give complete freedom to players to move where ever they wants. This is not an indication of good coaching, a good coach will not give their players this much freedom on the pitch and the players movements will be micro analyzed and decided by a great coach. The major positional problems also overlaps with technical problems as technical deficiency on certain areas forces some players to make unorthodox movement through out the pitch. Lets analyze it. Ramos and Pepe when paired are too close together when they are in possession. This is mainly because Pepe does not have the confidence on the ball alone. He doesn’t have vision to pass more than 10 meter when under pressure so he stays close to the other center back all the time. This makes it easier for the opponent strikers to press. Now instead of two players they only need one player to force a long ball/hoof ball from Pepe as it is now easier to cover two players. The center Backs being too central on possession the Anchor now has less space to operate and the space becomes more congested. The anchor is now forced to pass the ball to the wing backs or another midfielder coming deep. Wolfburg coach read this very well and he let the center backs have the ball. Being too narrow they don’t have any openings for a pass forward. He tracked the fullbacks very tightly with their wingers and effectively nullified them,with the exception of one moment which resulted in a goal. Pepe and Ramos often too narrow forces the Midfielder to go wide. The CBs don’t trust the Anchor . Barely we saw Pepe and Ramos passing straight to Casemiro. This is clubbed with the space being congested and them not trusting the Anchor’s ability to keep the ball. Now the free space is between the fullbacks and center backs. Both the midfielders, Modric and Kroos are now forced to drop deep and receive the ball, acting almost as auxiliary full backs. This makes them flat,you can see from the match itself they forms a horizontal line most of the time. The distance between the midfielders are now too big. Triangle shape is lost and now they can only pass back to center backs or make a risky pass to one of the forwards ,regardless of the suitability of the pass because in such a shape you cant not keep possession of the ball. Which is why we resorted to too much over the top ball’s in both the legs, not an efficient way to play when the opponent wasn’t even playing a high line.Wolfsburg man marked both Modric and Kroos and to compensate the flat structure now Casemiro moved up to form a very very bad 4-2-3-1.Being a DM He neither pushed very up to help the numbers in the hole nor was he useful deep now that both Modric and Kroos came deep. The midfielder structure is bad, the shape doesn’t look good. DM pushing high up to form a wicked 4231 isnt the way to go.. is this the best Zidane can offer to counter pressing game? Midfield often too flat. Lacking any kind of positional play. Clubbed with problems through out the positional play of the team. Our forwards aren’t creators. They are proper forwards who are lethal in the final third. They doesn’t have the ability of the Barcelona forward line to create chances for themselves in tight matches, instead they are highly dependent on the service.Wolfsburg played a 4-1-5-0, no strikers and 2 wingers man marked fullbacks, 3 men man marked Kroos,Modric and Casemiro (partially) and the one guy who had no man marking job was Luiz Gustavo. As you can see the space available to the forward is the inside hole space. Still the numbers in the back was 3 vs 5 , BBC vs Wolfsburg back line + Gustavo. The extra player they saved by not pressing the terribly positioned back line in possession was now utilized in the back. 5 vs 3 is a very comfortable number game. Our wide players Bale and CR doesn’t have the ability to utilize that inside hole space to creative purposes, an Ozil,Messi, type players would have enjoyed such a space and set up. Still it wasn’t about the ability of the wide players as they were simply out numbered in the final third. Even if they received a pass there was no one to combine to, they had to wait for Modric and Kroos to arrive. No one in the hole. Casemiro the furthest player to link up. As if ? There where some moments when the team shape became largely distorted and any kind of attacking move was next to impossible. The team looks badly coached in positional game. Scared in possession at the back and simply unable to support the forwards in possession. The gap between the midfield and forward line is a huge problem. Ultimately the shape doesn’t look good. Midfield so far away from the forwards, fullbacks closer to the forwards. Re: Lack of positional play, lack of coaching or lack of personnel? Because we have two CMs with similar approach. Both Kroos and Modric like to play deeper and need someone who play between the lines. We need a CM and a DM in the summer, or try Isco instead of Kroos. Pogba would be the best option IMO. i swear you guys act like this is your first season watching madrid or something, it has been like this for years, stop trying to act like this is some revelation , you don't know guys about positional play or tactics, again isco/james at lcm hype is a prime example, along with the constant need to blame kroos. watch the team win something and you guys gonna try excuses not to give props to certain players, i hope the continues to win this season without flopsco and fatmes. @Valkyrja wrote: Because we have two CMs with similar approach. Both Kroos and Modric like to play deeper and need someone who play between the lines. We need a CM and a DM in the summer, or try Isco instead of Kroos. Pogba would be the best option IMO. The two CMs are coming deep for two reasons though. 1. The Anchor has pushed up. The center backs are too narrow to play any ball forward. Especially it is pointless to give Pepe the ball as it will result in a turn over. 2. They do not trust the center backs and Casemiro to keep the ball. 3. It does look like zidane's tactical adjustment. Horrible one i might add. The two CMs are similar i agree but Kroos is still a pretty good CAM, it just that in flawed set up like this where even the DM is placed ahead of Kroos it is diffcult to operate to full potential. It's threads like these that make me feel proud of the Real Madrid section on GL. I apologize in advance for not giving you a proper reply to your great post and topic. This is my launch break at the office and I don't have much time at my disposal. But I wanted to thank you for contributing to our section and making it richer in content. It's nice to see that some of us aren't getting carried away with some of our recent results, and are aware and worried about our glaring weaknesses. This is one of the reason I'm still not convinced with Z. I already know he's no Pep, but I've been waiting since the day he took over for a shred or glimpse of brilliance from him, but in vain. He doesn't strike me as a meticulous coach with shrewd tactics and plans detailing every move of every player. And as a result, you'll see players "improvise" and go with their instincts which might bear fruits at times, but not always. But our inability to score from open play can't be solely blamed on Z; Our forwards like you said, aren't creators. They sit up up front and wait for the ball to come and nestle at their feet. And when they have it, they can't combine with each other to pierce the defense. So they either rely on their individual talent to break it, or end up passing the ball back to the midfielders. Our midfielders by the way aren't that bad. They have many limitations but their game would look a lot better with creators up front. Our defenders are brainless, mainly Ramos, but Pepe isn't that far behind either. This is why I think Nacho and Varane should be ahead of them in the pecking order. Barça won the treble with MSN mainly because they were lethal offensively and contributed a lot defensively. They had many weaknesses at the back and even in their midfield, but they nullified everything with their trident. We have to remedy this problem because we can't just expect Ronaldo to save our asses every time. I love the analysis. It's normal for us to get carried away by victories; We have glaring flaws all over the place. I believe some of these tactical flaws are as a result of the quality of personnel we have. Even the Barcelona of 2014/2015 that won 5 titles had a lot of flaws which were masked by the brilliance of MSN. Wenger noticed it too and after his second leg defeat to Barca, he said "Barca have never been more beatable than they are right now". my point is: Barca's style of play has largely been touted as the definition of strategic perfection mainly because the brilliance of MSN overshadowed their frailities. Its difficult to achieve perfection - the perfect player, at the perfect mental and physical fitness to execute the perfect strategy. We just have to hope we get by. I believe Zizou has a strategy which he cant execute given the type of players we have. I believe he is also scared to make certain decisions such as giving Nacho more time. I am happy a few people rate Nacho, i believe he should be used just as much as other centre backs. Also, its nice people can see how average kroos is, i thought their were some hidden things he did on the field that i never noticed.. If 4-1-2-3 is the formation we will stick too, then we better find a way to put isco back into the first team in place of kroos or get Pogba. I can imagine Hazard coming and adapting to that role. We would finally have someone who can make driving runs from the midfield and close up the space between the MD and Attackers. - Marcelo doesn't defend and neither does Ronaldo. Having Kroos try to be the midfield to hold down the fort defensively there (or Isco for that matter) is never going to work. You need a workhorse to cover for those two. - Modric does like to participate in the attack. Did it all the time with the Spurs. He was their most creative player. The issue is that Bale rarely tracks back too. So the midfielder has to play it conservatively so there isn't a gaping space in front of Carvajal for the opposition to take advantage of. - Casemiro is good defensively, but technically limited. So Kroos and Modric need to be close to him so he can release the ball quickly without making a mistake. This is another reason Kroos/Modric have to play low. 1- He decreased the line gaps. As a result, the opposition has to face a lot denser midfield both on the attack and on defense. It also allows for more passing options by our players. The risk is that the defense is playing higher so there's room over the top. Went from 4231 to a 433. 2- The fullbacks are more active and involved. That gives us a semblance of width. Only Carvajal can send a decent cross here and there... but there's a threat that the opposition needs to keep in mind so the opposition defense is more stretched horizontally. We're going in the right direction. BBC is the main issue... specifically one of the wings. Ideally, you want both wing players to help track back. But at the very least, you need one. Neither of our two wing players track at all. So one of Bale or Ronaldo need to go unless you move Ronaldo to the CF spot, in which case Benz can go. Also need a great athlete in the middle to be the workhorse. We have nobody in the middle that can hold the ball and create danger by making runs on the attack. Finally, we could upgrade Casemiro unless he really improves technically. Not a must here... this is more a "if someone better is available" move. After that, we need better backups (CF and CM specifically). Hala... you expect guys to just change their mindset and role for one game (the odd game where CR is not there) without a problem. Like a light switch. That's not how it works. You need time to cultivate a mind set in order to become effective at it. Our problem has been this for years... we bent over backwards to feed Ronaldo's ego and basically cut off everyone else's balls on the front line. You can't just re-attach those balls for the odd game here and there and ask them to magically recover their former self. Messi has done a fantastic job of sacrificing his personal game the last 2 years to allow both Neymar and Suarez to remain who they are. So when one of MSN is out, the other two aren't really asked to change... just to step up what they're already used to doing. Ronaldo's ego is so big, he would never sacrifice anything for the sake of the team like that. Come on man... you know better than that. One guy gets 400 shots per season and all the looks. While the others struggle to get 100-150 over 40-50 games and always need to react to what Ronaldo does as opposed to do their normal aggressive movements. Then you expect them to magically change how they play 99% of the games because Ronaldo isn't having a good one? That's not how football works and you know it. It's about practice, tactical repetition and mindset to reach an effective level. PSG suffer the same thing btw... Ibra galvanizes that attack so much that Cavani has become a role player mostly. He's not as talented as Bale or Benzema, so he's been rendered ineffective. Given Ibra is crap in CL mostly, PSG struggle in CL because Cavani and others aren't ready to fill the gap as they're neither mentally prepared nor tactically encouraged to do so 99% of the time. @sportsczy wrote: Hala... you expect guys to just change their mindset and role for one game (the odd game where CR is not there) without a problem. Like a light switch. That's not how it works. You need time to cultivate a mind set in order to become effective at it. we play to our best player's strength. you really expect bale and benzema to win us games ? i would like to see how many chances BBC create for each other. i'm pretty sure ronaldo creates more for benzema and bale than they do for him. I do like Sports reasoning behind our CMs not being overly (or hardly) involved in our attacking third. If I'm not too mistaken, it would be our full backs, our forwards and 2 CMs in attack leaving Casemiro, a blockhead and Pepe to enjoy being countered constantly. Having both Kroos and Modric be passive in attack probably is down to how the team is designed. That being said, either one of them needs to support our attacking third. Yes. Kroos is most definitely not pushing high up in possession because of Marcelo and Ronaldo. That is definitely true. How ever that does not really explain Casemiro playing further forward than Kroos. That is just further destroys the team shape and is a disaster in every sense. It is clear that is Zidane's tactics, a horrible one. This is not the way you cope with technical deficiency of your Anchor. By giving complete freedom to midfielders to move where ever they wants lol,,,even Laurent Blanc has installed much better positional play at PSG. Zidane needs to trust Casemiro to hold his position in possession. How is he going to improve in pressure if we are instructing him to not touch the ball in possession. Its not like He is terrible on the ball, he is actually decent on the ball. Lacks the confidence of coach and team mates. Casemiro going further was not to win the ball back quickly. Why would we risk our DM leaving his zone to completely destroy the team shape in order to win the ball back. Casemiro went forward so that the team can by pass him on possession. He went forward to let the other two midfielders to drop deep and play make. You can see he barely received direct pass from the cbs or even the midfielders. Zidane doesnt trust him and uses foolish tactics to compensate that. Casemiro is a good footballer, you can see it but you can also see he limited to what he can do with the ball. I don't mind we keep him but if there is someone better suited, I would suggest the club pursue. As Hala wrote, Casemiro rarely ventures forward like that and it feel like it was told to do that. I should also mentioned I totally agree with Adit's take on our CBs playing too close together but I also get why they do it. Pepe was never a good passer of the ball and Ramos is a block head so Pepe needs an outlet to pass to quickly and Ramos needs specific instructions or else he'll play goalie. See Hala, against Barcelona we played on the counter. Casemiro can not afford to leave his position in possession as it is suicidal and none of the midfielders got the time to dwell on the ball any way. We didnt play make from the deep,we countered. The wolfsburg is completely different game. I agree he usually stays back and is actually good on the ball. Yet in both the ties Casemiro was bypassed. He left his position to move up so that Kroos can come deep and play make slowly, which is what happened. That was clearly Zidane's tactics and im not agreeing with it. I think you misunderstood me, im not saying Casemiro is the problem, im infact saying Casemiro should be trusted on the ball alot more and should have allowed to hold his on position during the build up. The tactics to bypass him was horrible and unwarranted. He was bypassed because he can't be trusted with the ball under pressure or to pick out the right pass. 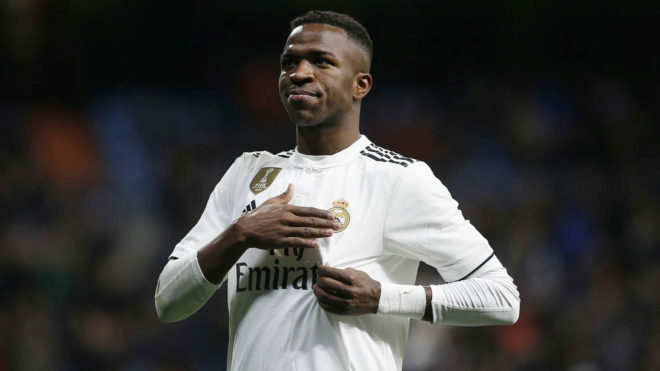 The idea is to get the ball to the midfielders who are best equipped to make decisions with it AND not put Casemiro in a position where he will likely make a mistake.